Since my last attempt at debugging, I re-mapped all the reads using Subjunc to avoid problems arising from the large amount of soft-clipping Subread does. Very unfortunately there are still some problems. This analysis continues the search for bugs lurking in the sequence processsing pipeline. This problem affects 727 out of the 19027 total genes (3.82%). For these problem genes, the median number of affected samples is 1 and the max number of affected samples is 28. Next I identify the problem gene that affects the most samples. Note that this problem genes affects both high and low quality single cells. All three lanes have reads but zero molecules. There are many reads that map to this area. They don’t all have the same UMI, but many do. It looks like it is going to be another soft-clipping issue. 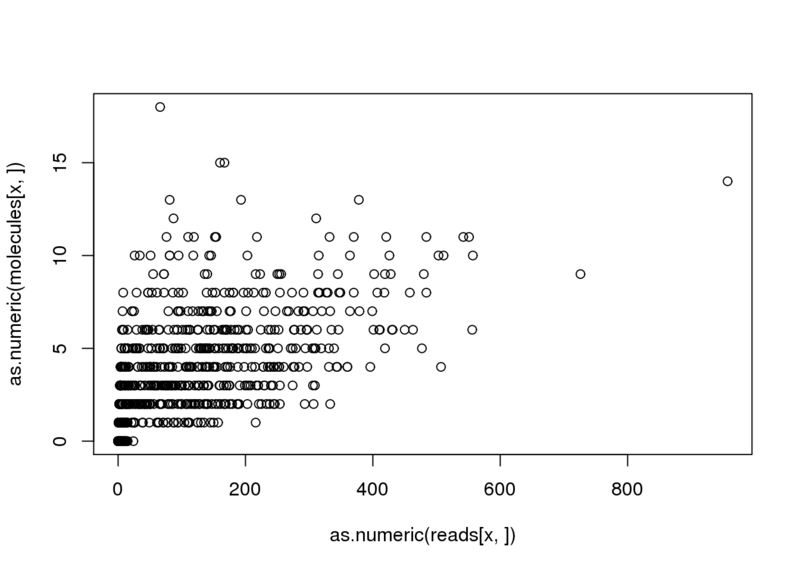 After the deduplication, one read is kept for each UMI-start position combination. In this case it is challenging to identify. First, this region has lots of seqence coverage. Second, these reads are on the reverse strand, so the SAM format shows the reverse complement of the sequence and the start position (which would be the 3’ end of the read), so I can’t identify it easily by eye. I use pysam to identify the molecule that was kept. Specifically, I used similar code to what UMI-tools uses for reads on the reverse strand (line 527). Also note that the variable pos, not start, is what is used for counting UMIs. Line 531 is confusing, but they have a reason for doing it that way. The coordinates are confusing. The coordinates in the SAM file are 1-based. The pysam coordinates are 0-based, but sometimes the final base is inclusive and sometimes it is exclusive. To understand the code below, the most important to understand is reference_end (aka aend). aligned reference position of the read on the reference genome. reference_end points to one past the last aligned residue. Returns None if not available (read is unmapped or no cigar alignment present). Why doesn’t this one saved molecule map to ENSG00000205544 like the other reads? What? It has the same 5’ start position. How could this one be marked as amibigous while a few of others were able to be assigned? I checked on UCSC, and this region is very crowded, with 3 separate genes. I am skeptical how likely they are all to be “protein-coding”, but I went back and confirmed that is how they are defined in the Ensembl Biomart. I created a reproducible example to post to the Subread forum. I created a fastq file that contained the one saved molecule and one of the reads that was successfully assigned. All the data files are in my Public Dropbox folder. I won’t reproduce the example here since it is well documented in my post.